Last month, I signed up for Amazon Prime. Yes, I am very late to the show. I had the expectation that I could order most anything and it should ship, for free, and I'd receive it within two days. It turns out it's not that simple. 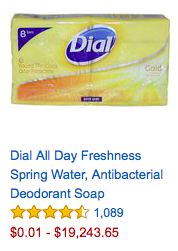 For starters, I did a quick search for Dial soap and added it to my cart. That's when I discovered, if I'm not careful, that I could end up paying almost $20,000 for simple bar soap. I also had to look, carefully, to distinguish between Amazon Prime, Amazon Prime Pantry, and Add-on Items. Two weeks ago, a friend attended a seminar explaining how savvy entrepreneurs buy close out deals from places other than Amazon and then have their items shipped to Amazon for storage and fulfillment. At a glance, these items may look like they're being sold by Amazon, but they're actually only stored and shipped by Amazon. A third party is the actual seller. This can be a great service for an entrepreneur who has products manufactured in China and shipped to the US. Rather than the entrepreneur storing their inventory in their own garage, or leasing a warehouse, they can have the products shipped from China to Amazon for storage and fulfillment. The gotcha, for the customer, is when an entrepreneur sells an item on Amazon that Amazon already sells at a cheaper price. As the Syms Corporation used to advertise, which applies doubly so to Amazon, "An educated consumer is our best customer." Add-on items are another customer gotcha. Today, I placed an order for a few staple items that will be fulfilled tomorrow. A couple hours later I remembered that I needed to order one more thing (paper towels). I found some paper towels to order, but it was an Amazon Prime Pantry item which required an additional $5.99 in shipping, even if it's an Amazon Prime exclusive. So I passed on that. Next, I found some more paper towels, that were part of Amazon Prime, and not Prime Pantry. But, when I went to order it, I discovered it was an Add-on item meaning that it couldn't be shipped as a single item. I was hoping to find a way to add it to my pending order that was shipping tomorrow. But alas, I didn't find a way. In the past, I've cancelled a pending order, re-added the items I had just ordered and then included the Add-on item. Today, I decided to pass. Perhaps I'll remember to order it next time. I love that Amazon has enlisted the USPS to make delivers on Sundays but I wish there was a simpler way to modify my orders. Perhaps there is, but I don't know about it, yet?? ?